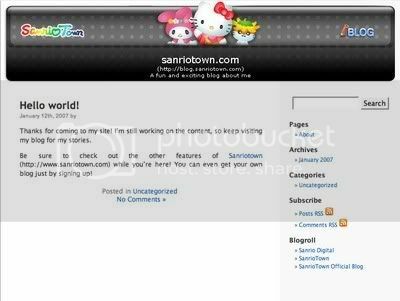 Sanriotown continues to reinvent itself to provide its users a better Sanrio online experience. 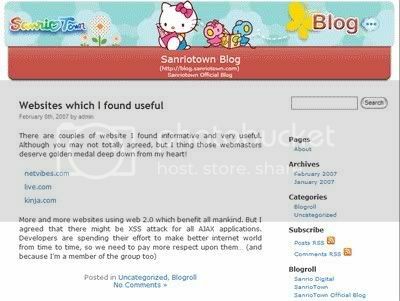 The newest feature in the Blog Section allows Sanriotowners to change their templates. In the past months, there was a default template for all blogs. Now, there are three other templates that users can choose from. It does not matter what account they have, whether its a @hellokitty or @kuririnmail. They can try whichever suits their style and mood. Wanna change your blog template now? Here’s how. Just go to the Blog Section. You will see a new tab which says “New Themes” (along with Dashboard, Blogroll, etc). Simply click on the template you want to use. It’s that easy. Sanrio Digital - a joint venture between Typhoon Games (HK) Ltd. and Sanrio Co. Ltd – recently participated in the highly regarded Hong Kong International Film and TV Market (FILMART), where world-famous Sanrio characters were put into the limelight with new digital entertainment products and services that are bound to leapfrog Hello Kitty and friends’ popularity into cyberspace. 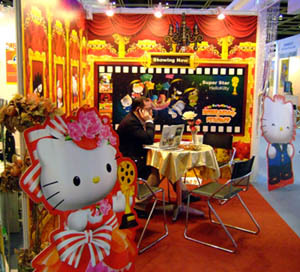 Sanrio Digital’s booth at FILMART. The next big thing to look forward to from Sanrio Digital is the Adventures of Hello Kitty and Friends, a full three-dimensional animation that really depicts the cute Sanrio characters in a more realistic perspective. This will surely be an instant cybercraze, multiplying the cuteness factor of Hello Kitty and friends to the zenith level. To have a sneak peek of what to look out for, see this. Digital Entertainment, Sanrio Digital’s turf, combined with film, was touted as the top world trend with a foreseen highest growth potential in the next two years. This is good news since it means that we will be seeing more and more of Hello Kitty and other Sanrio characters in the future. Sanrio Digital’s array of products includes online and offline games, mobile content and services, entertainment media, and the Internet in general. So, keep clicking those keys because Hello Kitty is just several clicks away. In the meantime, visit www.sanriotown.com – Sanrio’s online presence, and www.sanriodigital.com for more details. Gear up for a new adventure with Badtz-Maru, your favorite mischievous little penguin who is celebrating his birthday on April 1. Sanriotown’s most recent addition to its action games depot - XO Cave Adventure - takes you to a cave expedition in Antarctica, Earth’s southermost continent. 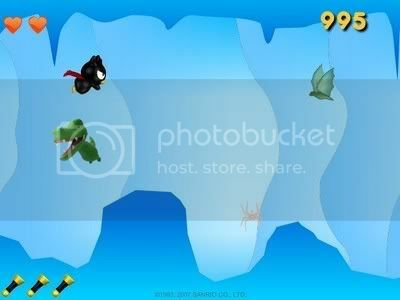 Help Badtz-Maru traverse the cave by avoiding hostile creatures and sharp cave formations that endanger his life. Collect heart, star, and flashlight power ups to strengthen Badtz-Maru in his undertaking. Check out the action in this all-new exciting adventure. Play now! The new year starts off with a blast in Sanriotown! Not just one, not just two, but 3 updates for the new year! * New wallpapers, screensavers, and calaendars are now available in the download section! * Kerropi, Pochacco, and Badtz Maru take over the Avatar Section in the Forums with 4 new avatars ready for use! * New stamps for Kuririn Mail Users are available to send e-mails with! Be sure to check them all out and let us know what you think by entering the forums and leaving your comments there! The wait is over! Those who filled up the Kitty Shop surveys, intrepid designers, and the naturally curious can now check out the results of the more-than-a-month long survey we took beginning in November. Check out which options garnered top spot in your eyes. See if your choices are the same as other users in the design you want in your Dream Shirt, Bag, and Umbrella. Did people choose to have a cosmetics pouch instead of straps padding on their bags? Would anyone want a color-change umbrella? How long should the shirts’ sleeves be? What color reigned supreme for these items? All of these questions and more will be answered in the Survey Results section of Kitty Shop. Valentines Day Special! The first ever legalized MTR Hello Kitty Wedding in Hong Kong on the 14th of February and the MTR Hello Kitty Love Garden Launch! MTR passengers can indulge in a special romantic moment at the “MTR Hello Kitty Love Garden”, launched from today to 14 March 2007. The Love Garden is a prelude to the first-ever legalised MTR Hello Kitty Dream Wedding in Hong Kong. Specially designed by Sanrio, Hello Kitty and Dear Daniel will appear in the “MTR Hello Kitty Love Garden” in wedding dress to celebrate the joy of love with MTR passengers. On the 14th February where the first MTR Hello Kitty themed train will take the bride and the bridegroom from MTR Tsuen Wan Depot to Hong Kong Station. The bride whose gown will be full of Hello Kitty patterns which are made of Austria crystals and the bridegroom will experience an elegant and unique wedding with the civil celebrant, Hello Kitty and Dear Daniel. The first MTR Hello Kitty themed train will run on the Tsuen Wan Line until 14 March 2007. You are currently browsing the Kitty News Blog weblog archives for March, 2007.